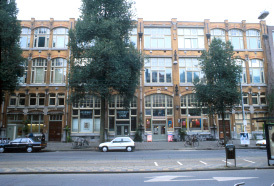 The Bilderdijk building's ground level street front is mainly given over to shops, cafe, art gallery; the entry to the night-club in the east side semi-basement, and 3 entries into the Collective. 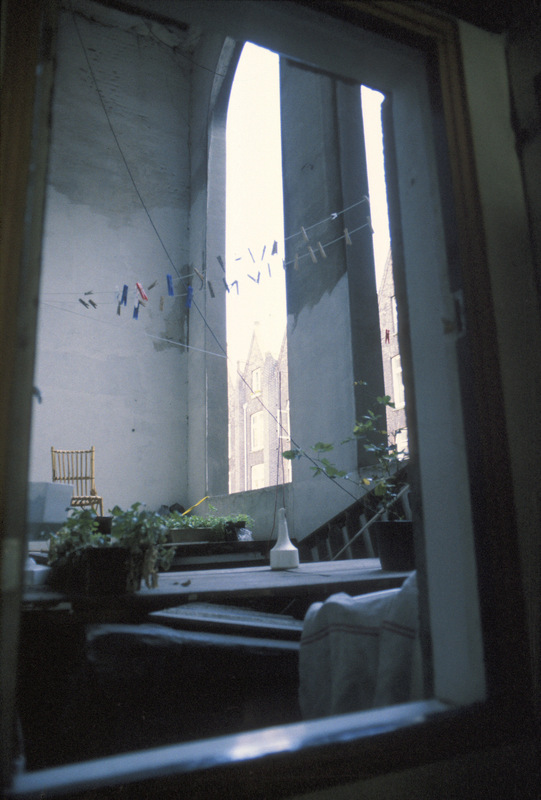 At each end of the west facade a row of small L1 windows indicates the shallow entresol floors - the south (right) entresol is a small enclave including 3 apts, the north (left) a single large apt. 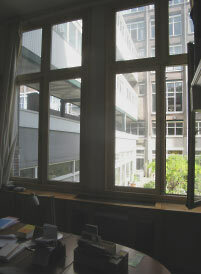 The two upper big-windowed levels are Bilderdijk's most populous apt floors: L2 is the 'Glazed-Court' enclave; L3 is the largest enclave in Tetterode. 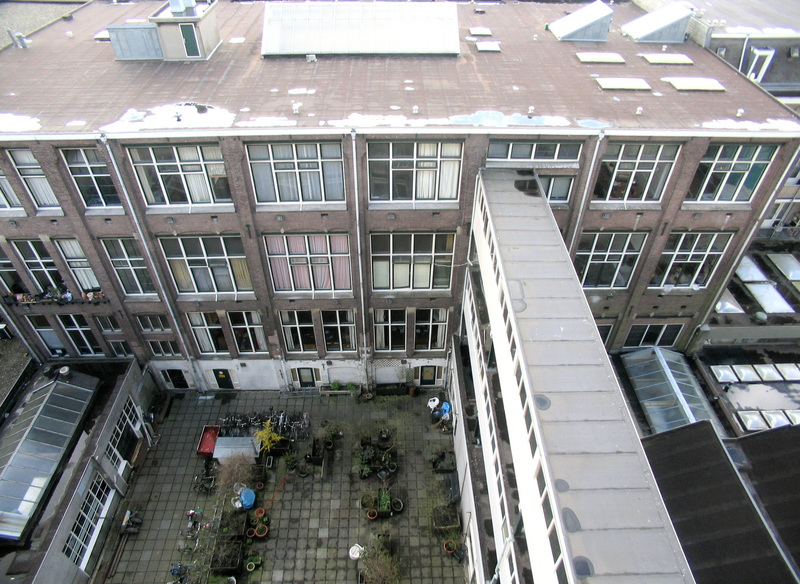 Bilderdijk's courtyard facade and its two bridges to Dacostakade (from Hartcamp's south terrace 'Sky-Lawn'). 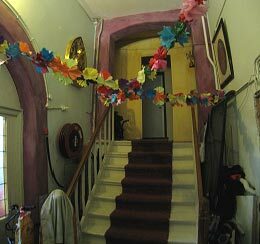 The lowest level walls a semi-basement used by an external night-club "De Trut". 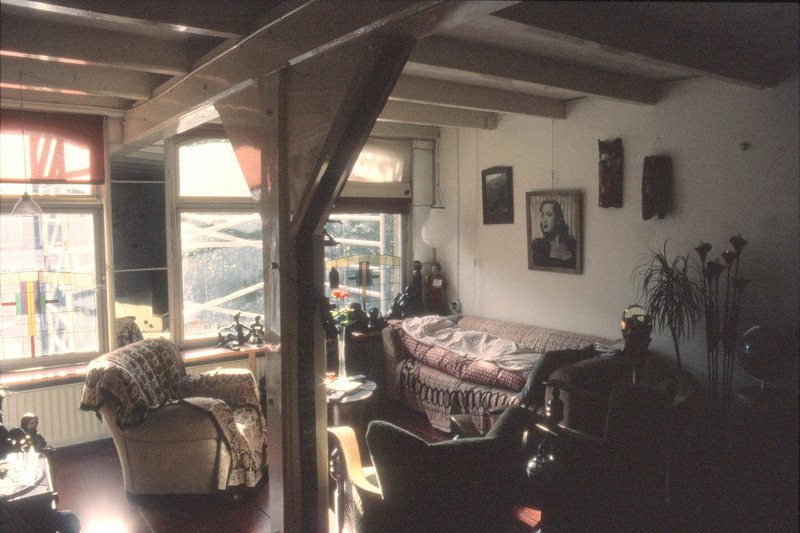 The first row of paired-windows belong to the 3 1-bay apts of the bd-L1/lm enclave [the "Lettermagazijn"]; its kitchen window is under the bridge. 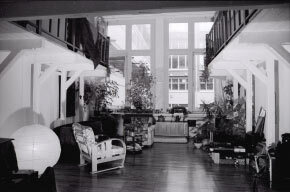 The second row of windows belong to apts of the bd-L2 enclave [the 'Glazed-Court'] - the lowest bridge leads directly into its centre. 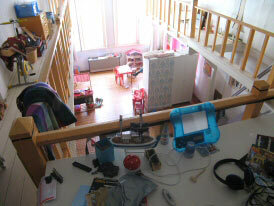 The top row of windows belong to apts of the bd-L2 enclave - the upper bridge leads directly into its entry-hall space. 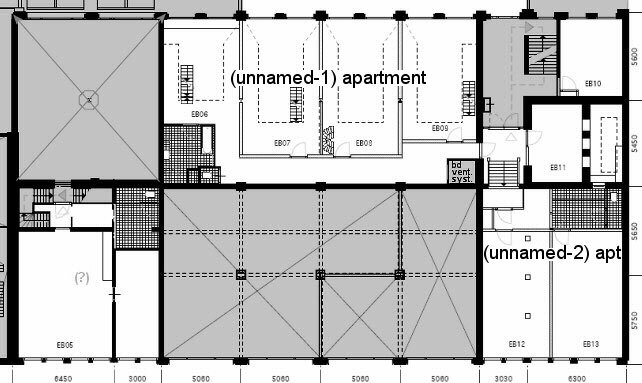 L2 enclave 'Glazed-Court' (with roof-lit centre). 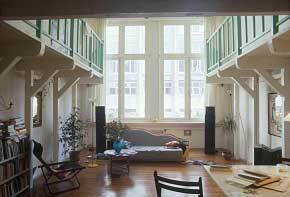 In this section we will move upwards through the Bilderdijk old building's three living-space levels. Bilderdijk's L1 is confusingly split between east and west portions of different height - its L2 / L3 floors are constant in level across the whole building. 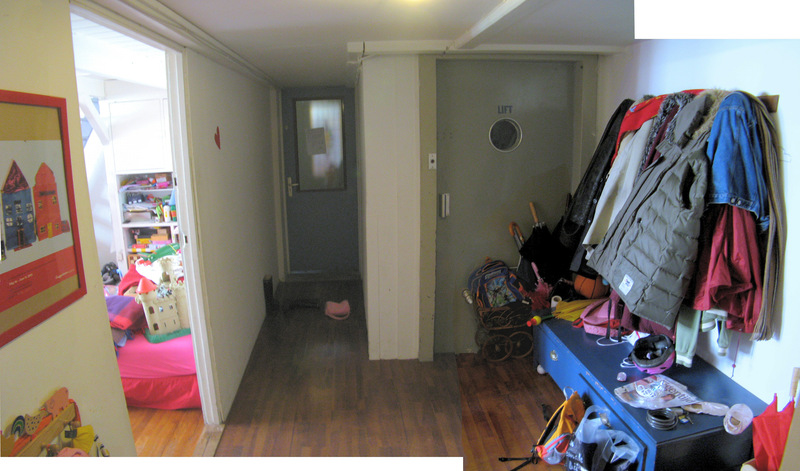 The west half of L1 (over a semi-basement) is lower and thus its apts are normal height, the east half is over ground-level shops and is thus 'entresol' ("half-height floor"). 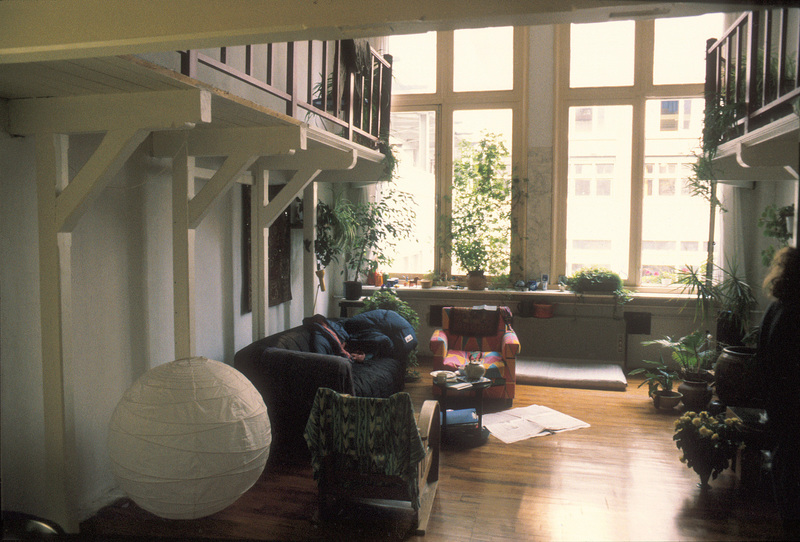 On L1 are the most radical apt transformations: its two enclaves have each coalesced into a huge single family home. 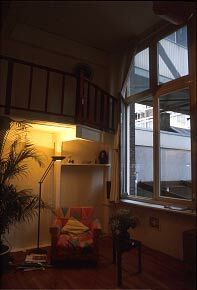 On L2 and L3 many apts typify Tetterode's smaller living-spaces: one window-bay single-volume with a 'platform' mezzanine. 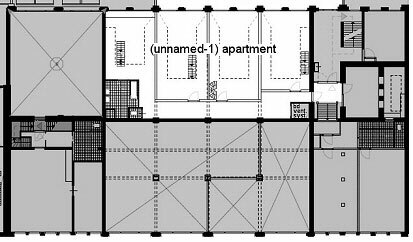 Among these are those of special significance: for instance Rein's apt [bd-L2 "Glazed-Court" enclave] is a very complex example of the type and will also serve to illustrate an aspect of design-development that is typical of these improvised dwellings. 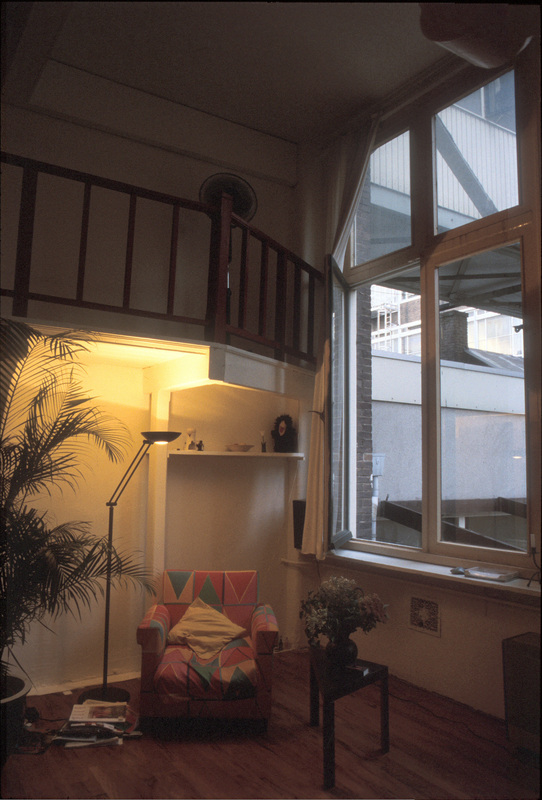 Though many L2 and L3 apts are typical their enclaves are not - both their layouts are influenced by the Bilderdijk building's width and the consequent size of its enclaves, and secondly a huge light-well that removes the centre of L3 and provides for L2 a central lit court (the "Glazed-Court"). 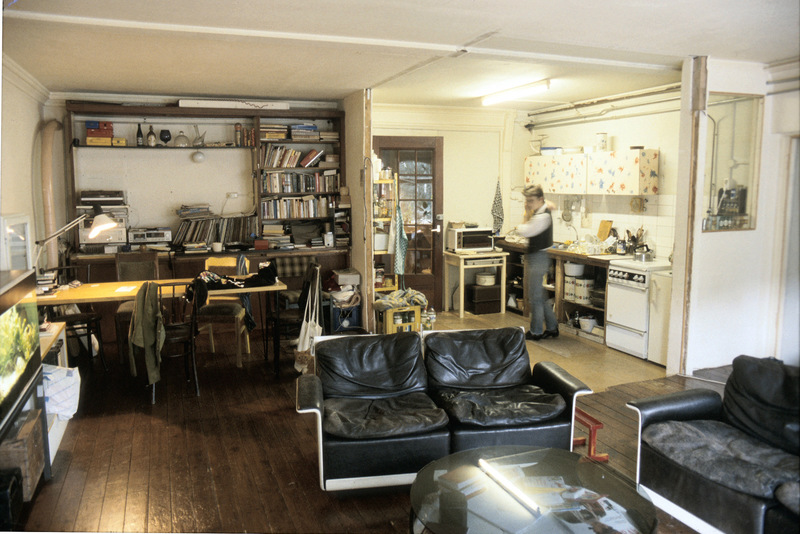 In the 1990s there were 32 Bilderdijk living-spaces, when revisited in 2008 there were 29 and several were substantially changed by new users, indeed two whole enclaves had each been transformed into single family homes. 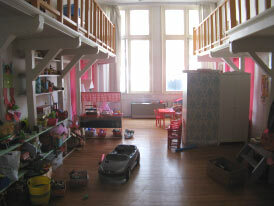 A reduction in the total number of living-spaces is an tendency in recent Tetterode. In this section we will visit 26 living spaces, some recorded in two states of occupation. 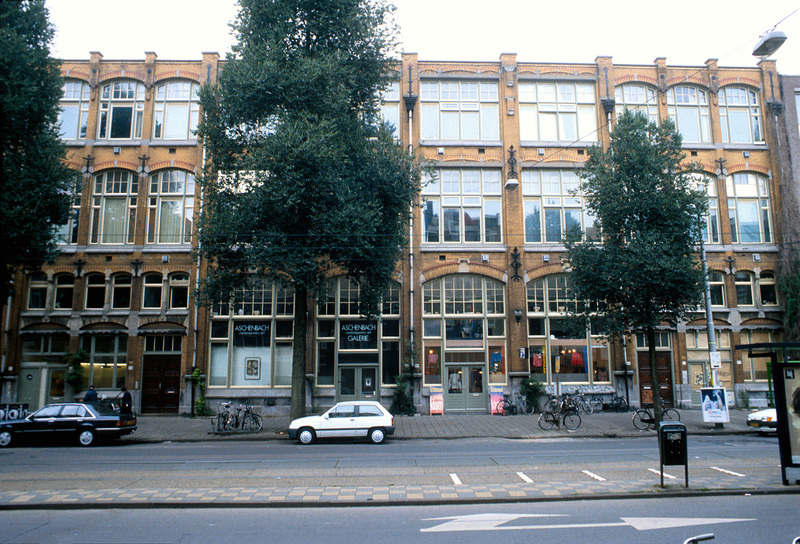 BILDERDIJK OLD BUILDING: PLAN LEVEL 1 - "LETTERMAGAZIJN" & "ENTRESOLS"
In the centre, with its windows opening to the Courtyard are the 4 rooms of the "Lettermagazijn" enclave [bd-L1/lm]. At the south end [plan rt] is the "S Entresol" enclave [bd-L1/eS]. 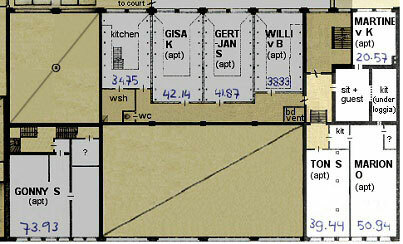 At the north end [plan lft] is the "N Entresol" apt [bd-L1/eN]. 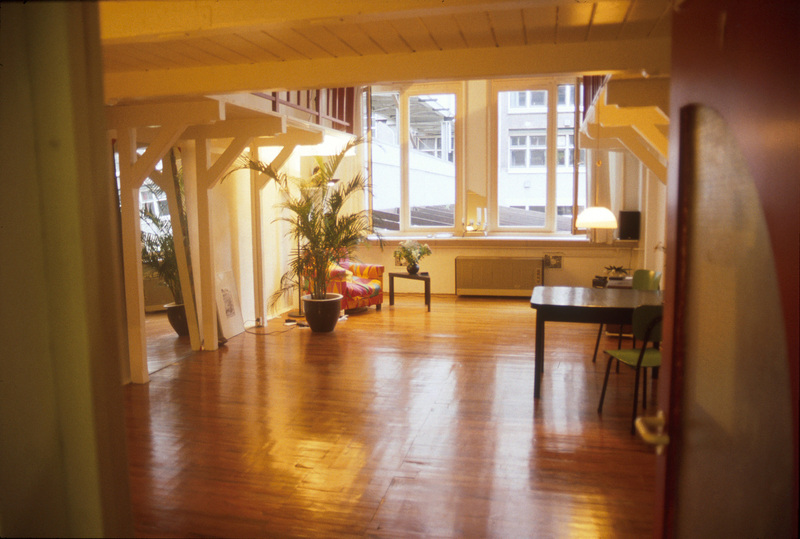 Bilderdijk level-1 contains two enclaves: the "Lettermagazijn" and "South Entresol", and a large independent apt known as the "North Entresol". 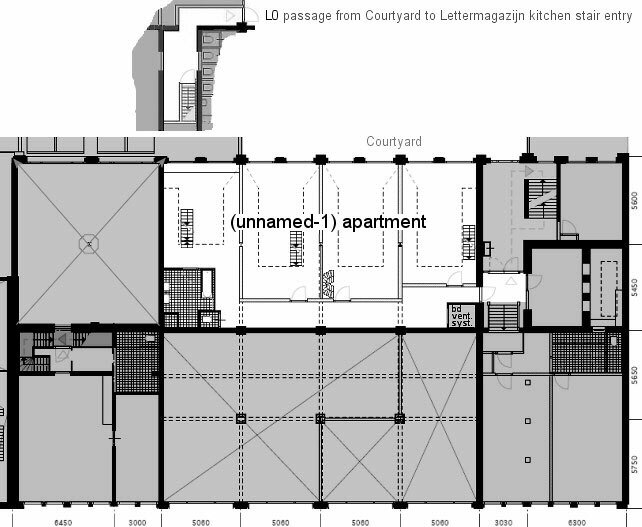 Level-1 is complex - the floor is fragmented into two areas by two intrusive and asymmetrically placed street-level 7m-high voids: the Tetterode Company Entrance Hall in the block's NE corner and its former show-room across the centre of its W side. 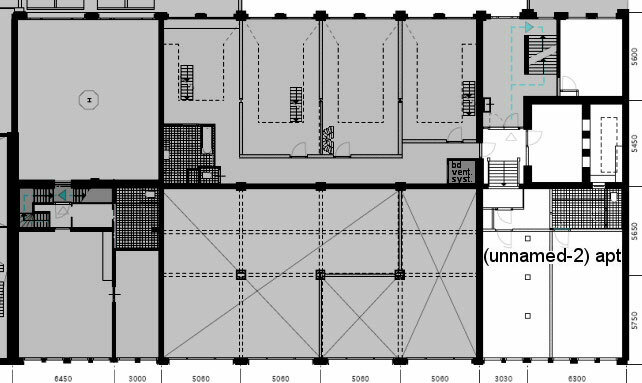 Furthermore the floor has two levels: its Courtyard-facing east side is over a semi-basement and thus lower - consequently supporting normal height room spaces; the two 'entresol' floors on its street-facing side are over ground-level shops and thus shallower "in-between floors". 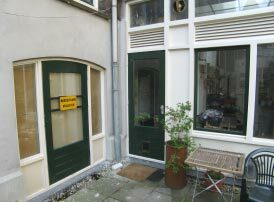 Spread along behind the Courtyard's east facade is the "Lettermagazijn" enclave - in the normal height space over the semi-sunken "Trut" nightclub. 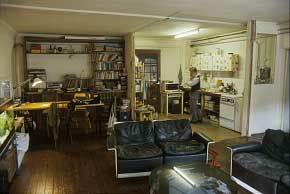 A row of magnificent rooms culled from the factory's letter-type store. 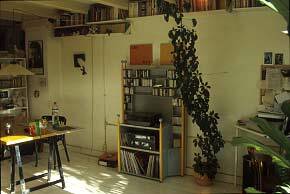 The so-called "South Entresol" was (when recorded in mid 90s) an enclave of three apts with a shared social-space/kitchen. 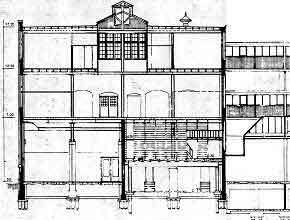 It is confusingly named since it occupies the building's full width and thus only its west half is actually an 'entresol'. It is entered from the building's south-east stair into the lobby of its east portion, which comprises one apt and the enclave's shared space. The lobby contains the east portion's elaborately glazed doorway and a stair rising to its shallower west portion, the 'entresol' proper, comprising two apts; there is also a weirdly located and inconspicuous door into the Lettermagazijn enclave's south end. The "North Entresol" living space is not an enclave, it does not, like its southern twin, extend beyond the entresol's boundary which here is filled with a single isolated apt, confined to half the building's width by the building's north-stair and the 7m high Co. 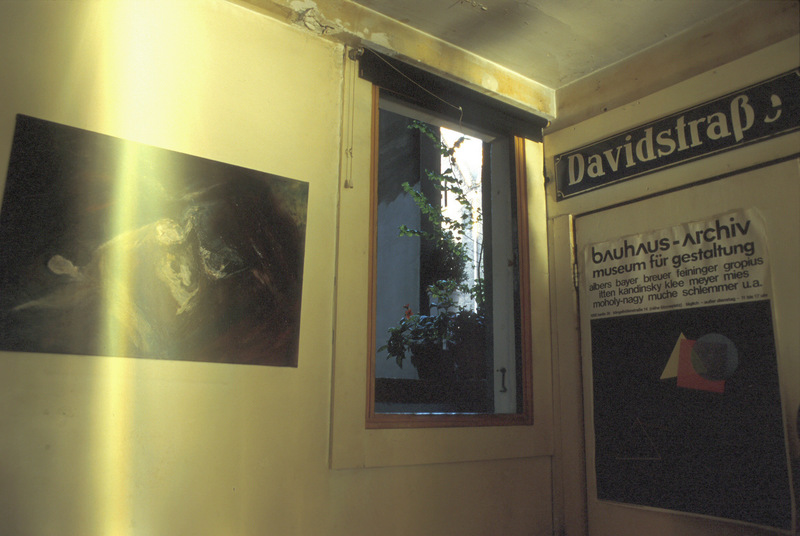 Entrance Hall beyond. 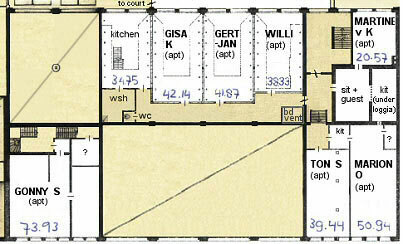 These west-front "Entresols" were designed as apts (for factory staff) . 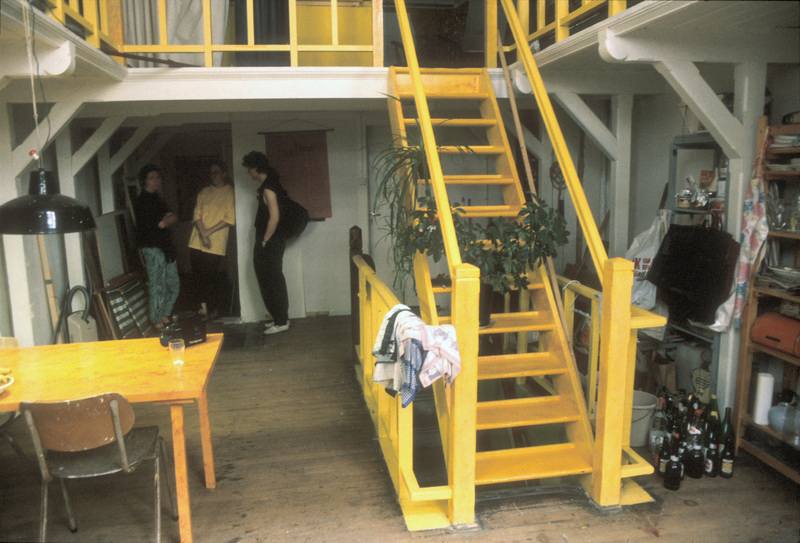 Even though their spaces are now re-divided by new walls, their floor height, enclosure and separation, window-style, service-installations, (and perhaps more subtle traces of intention and use), convey a sense of domesticity completely absent in Merkelbach; which achieves only 'hostel-floors' in Hartcamp; and is otherwise in Bilderdijk reliant on the 'family-like' cohesion which results from social autonomy and isolation (Lettermagazijn enclave) or centralized physical/social focus and relative isolation ('Glazed-Court' enclave bd-L2). Their analogue is the DE LOODS 'worker's house' [ref:] and to less extent its Customs Office [ref:], and the SILO's Centre-Stair offices [ref:]. 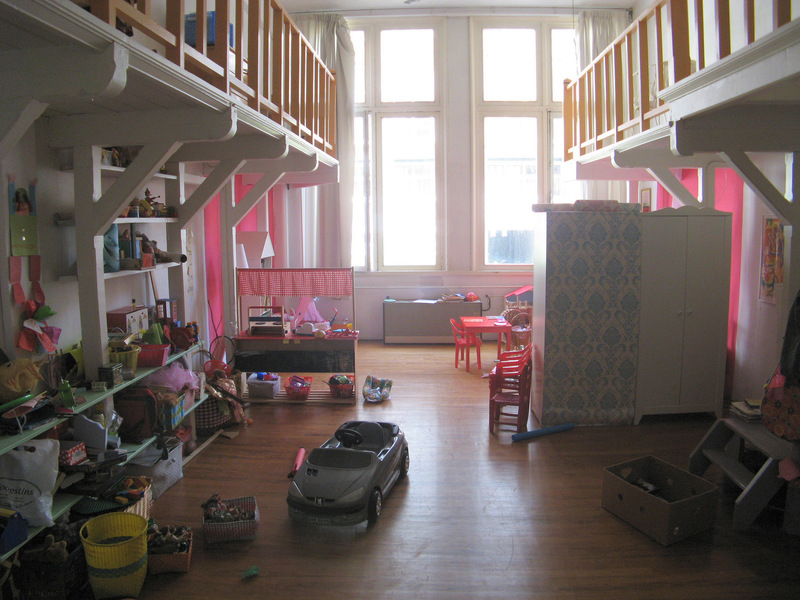 When visited in 2008 the most obvious expression of the burgeoning needs of Tetterode's young families - the enlarging of apts by amalgamation of neighbouring spaces (lowering its population of adults and raising that of children) - was the transformations of the Lettermagazijn [bd-L1/lm] and the "South-Entresol" [bd-L1/eS] from enclaves to single huge family homes. I re-recorded the Lettermagazijn but was later excluded from the now totally "private" South Entresol, one of several indications that the Collective is evolving towards a 'co-operative of private homes'. 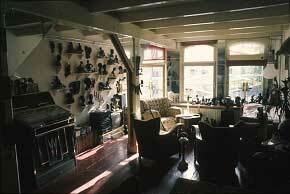 In the centre of the E side, with their windows opening to the Courtyard, are the four rooms of the "Lettermagazijn" enclave. 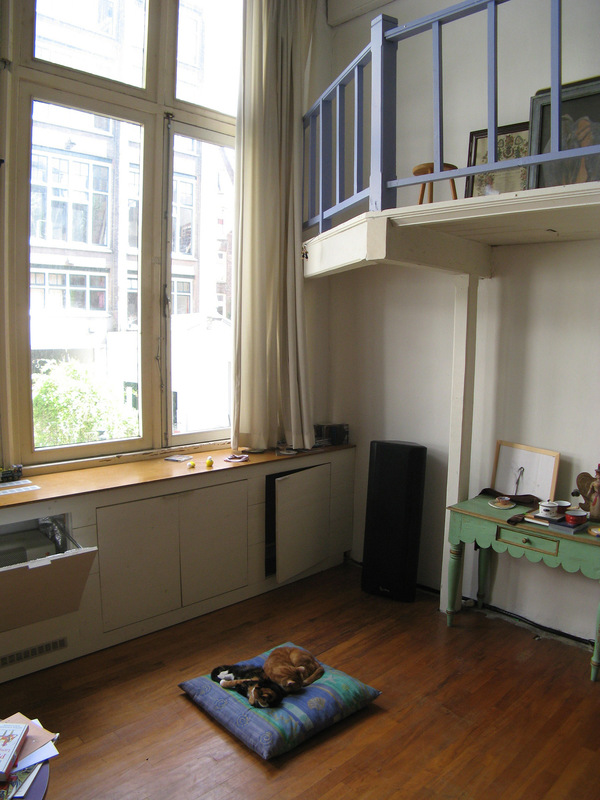 This is the most serene and elegant of Tetterode's enclaves. 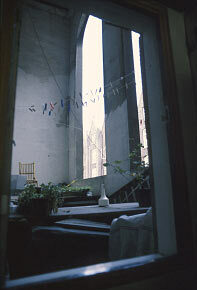 From the outside its row of big windows dominates the south side of the courtyard - but from within it is so hidden that a resident two floors above claimed not to know of it. 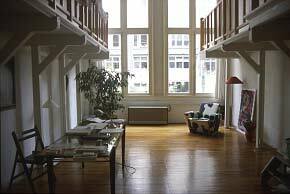 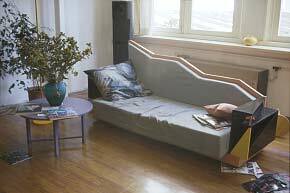 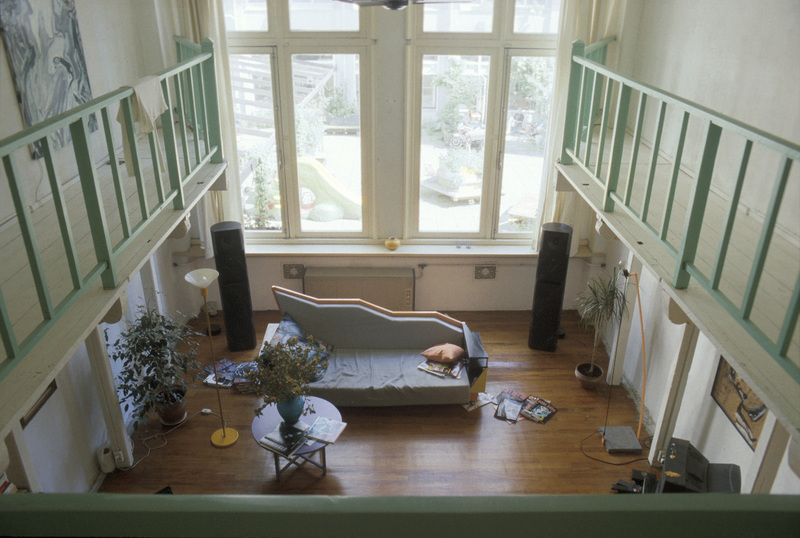 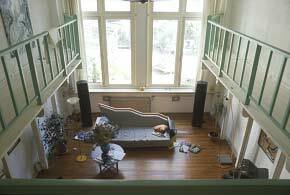 In c 2004 the Lettermagazijn enclave became a single living-space. 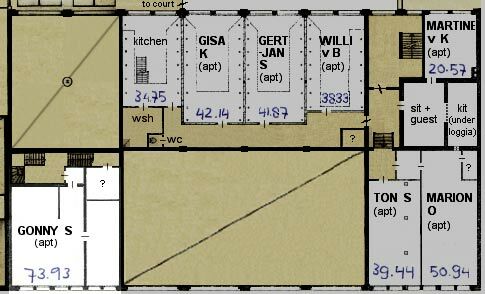 Thus any comparison of older and newer versions of an enclave's apts and shared facilities is transcended by the fact that these are now all parts of a single home. 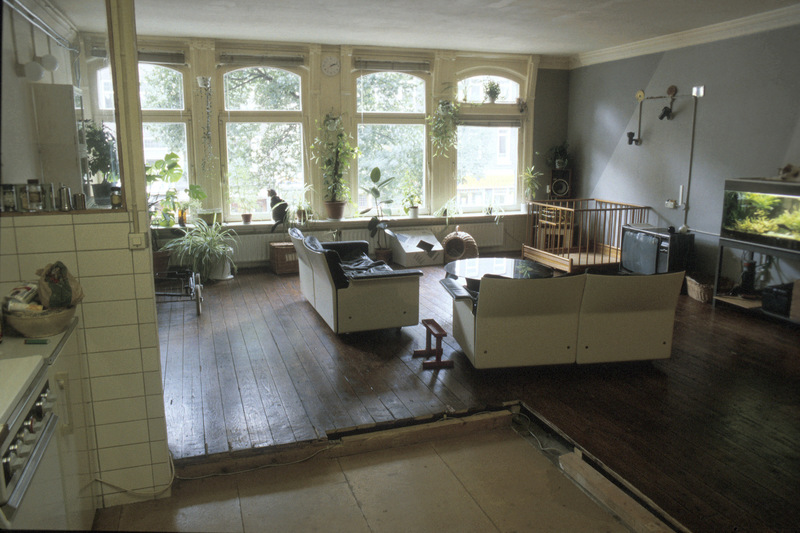 The 1990s enclave is shown first and the independent home (as it was in 2008) second. The Lettermagazijn was built as the type-foundry's 'letter-store': a single rectangular space half the building's width (19m x 10m x 4m). 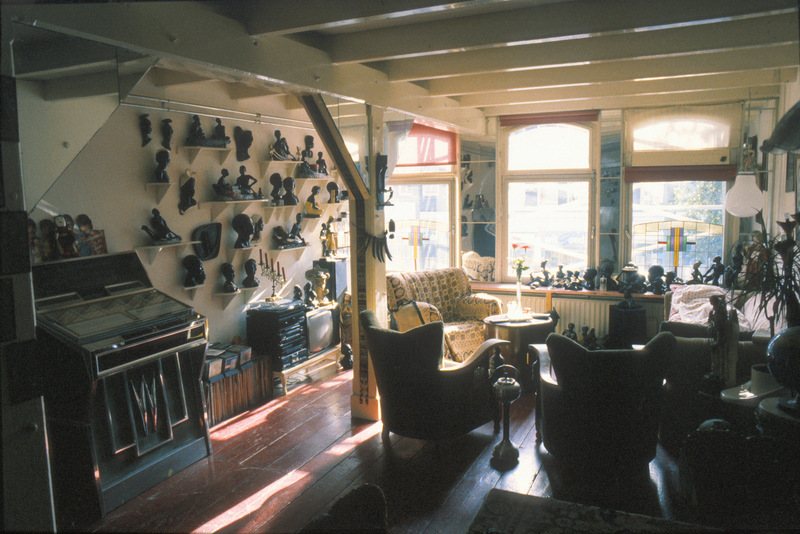 All the floor-surface - including the long mezzanine gallery along the inner side of the big room and its jetty-like extensions towards the windows - was crowded with rows of shelved cabinets filled with lead type specimens. 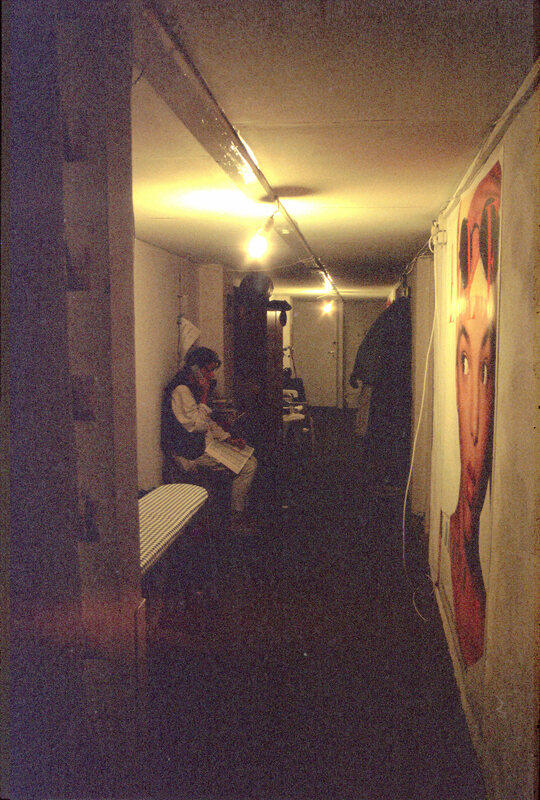 In spite of the high quality of its fittings (including a hard African Iroko-wood floor) the space was packed full, dark, painted olive green. In 1986 three people removed all the type-cabinets (yielding much clean planking) and changed it into a row of four big rooms by building dividing walls along the centers of the three promontory galleries and between their twinned supporting posts. 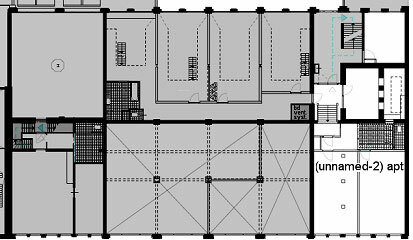 They walled out a common access space beneath their mezzanines, linking the three apts with a social kitchen and a completely tiled 7m² shower and wash-machine cell with a separate wc. 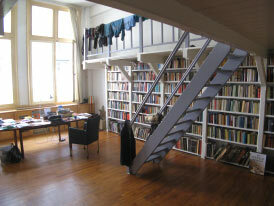 The Lettermagazijn enclave has entrances at both ends, but finding them is puzzling. 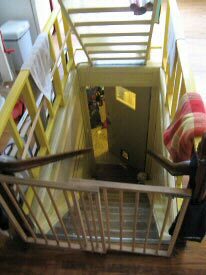 Its north entry is inside an anonymous door at the courtyard's NW-corner: hidden round the angle of a small dark passage is a locked door whose little window faces stair-treads - if one can gain admittance here one will emerge into the centre of the enclave's beautiful kitchen under its yellow gallery steps. 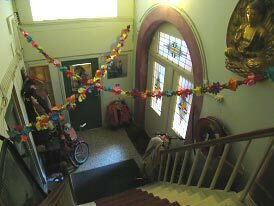 Its south entry is inside the locked [bd-L1/eS] S-Entresol's foyer where ones curiosity must resist an over-grand stair plus a facade of coloured glass and notice a dull little locked door - if one gains admittance here one is finally inside the enclave. 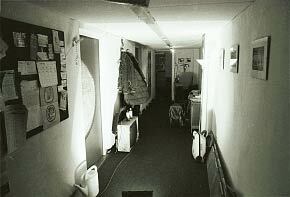 It opens into a cornered passage into a long low-lit space, so 'within' that "hallway" is too preliminary a term, "corridor" too active and cold for this shared place that lies behind all the rooms...their 'exchange-space'. 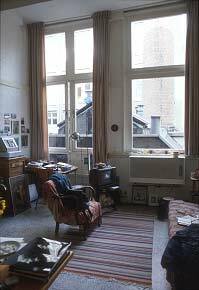 A comfortable sense of shared privacy and secure enclosure pertains here; it seems a 'subterranean' distance to the 'outside' - contradicted by views, through 1970's shop doors, of magnificent rooms with vast end-windows. 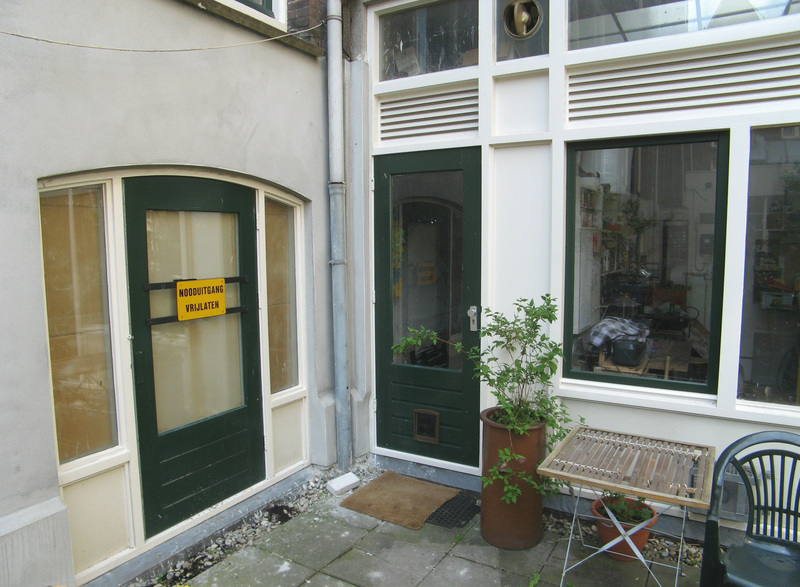 This (locked) door opens directly into the Lettermagazijn enclave's 'common-space' corridor. The common space along the enclave's inner side, that can be entered (if one finds the ways) at either end, and which serves like an inner street the three courtyard facing apts and kitchen, plus a bathroom/wc. 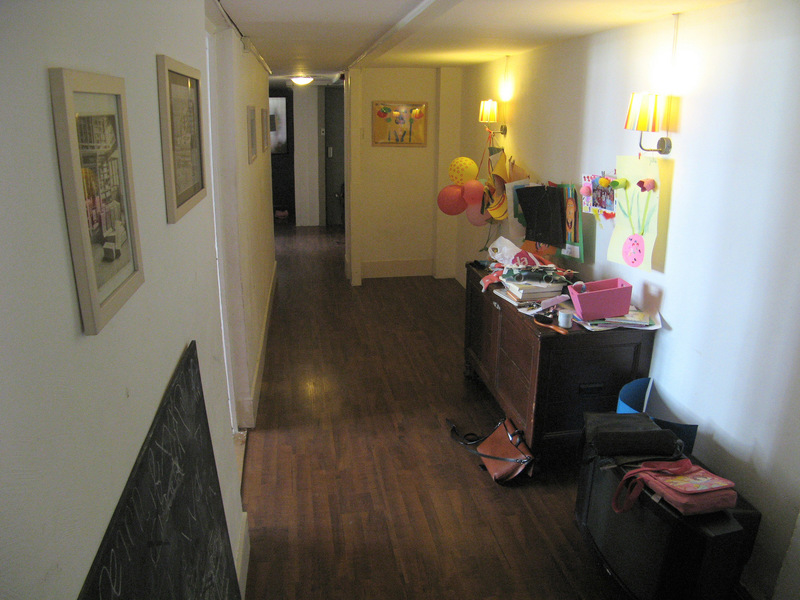 View towards its south end, past Gert-Jan and Gemma apts, to the exit near the S-Entresol. 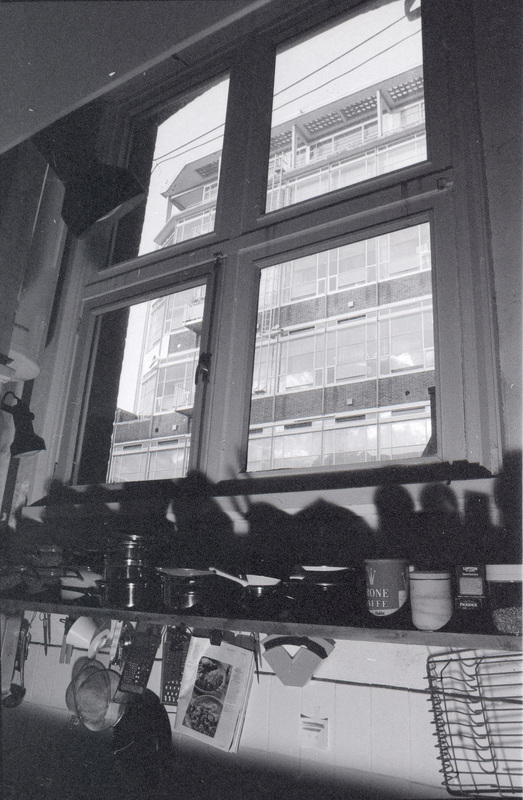 View to the north, past Gemma, Gert-Jan and Gisa apts. 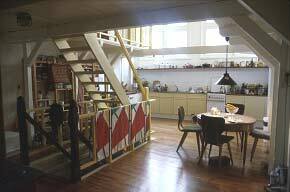 The sense of compression in this 'common-space', which runs under the mezzanine extensions of the east-side rooms, is relieved and indeed dramatically enhances the sense of heightened volume as one enters any of the three flanking apartments. Across the far end is the wc and bathroom, there the passage makes a right turn into the enclave's beautiful Kitchen. 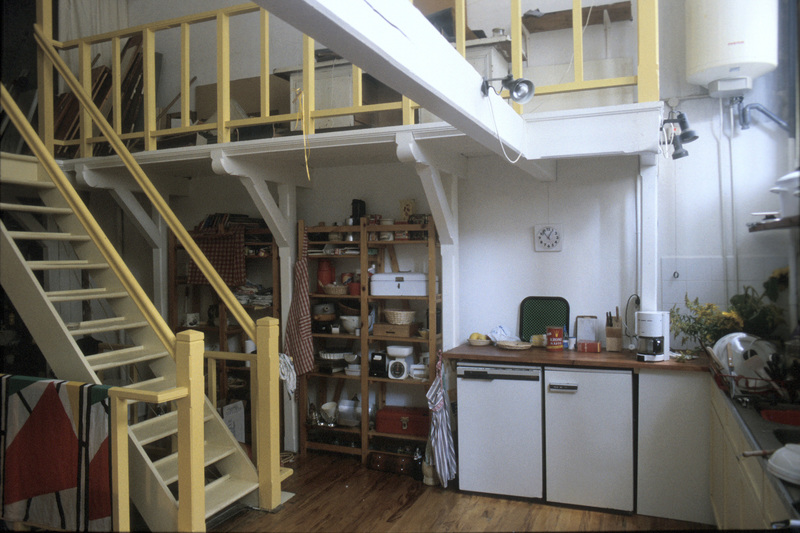 The shared kitchen and dining space at the N-end is more enclosed than the apts: Courtyard workshops claim the lower part of the big window and its upper-portion is shaded under the bridges. 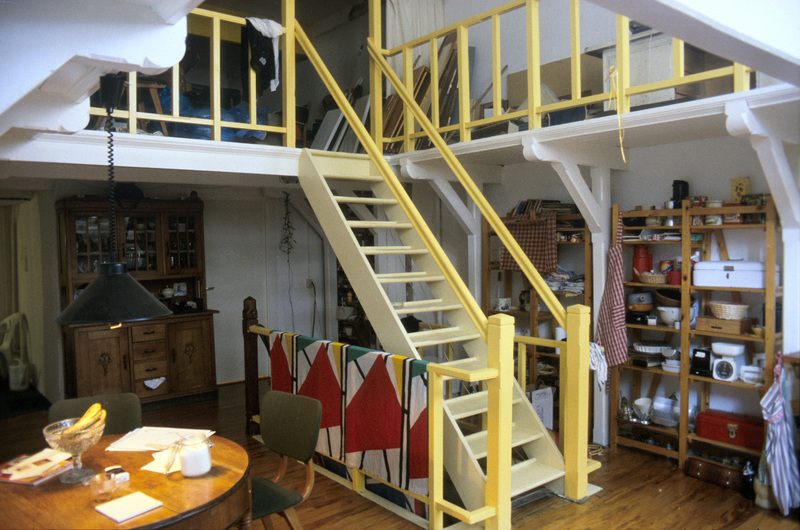 The dominating feature is a monumental and clearly conceived wooden stair, up to the gallery and down to a passage to its 'hidden' courtyard north entry. 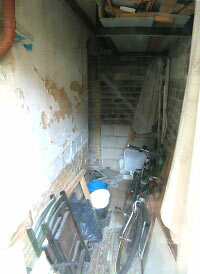 At the back left is the entry from the common-space; at the rear is the wall and door of the wash/wc room. 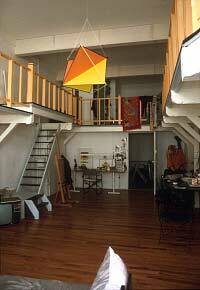 The central stair ascends to a gallery and also descends to a locked door, exiting into a narrow passage to the Courtyard's NW corner. 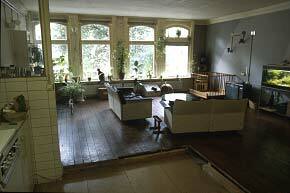 The strident colors of 1990 have been tamed and subtleised. 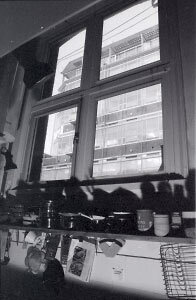 The kitchen window looks over the N-end workshops and is thus shortened - starting too high up the wall to allow a horizontal view. 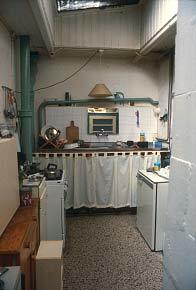 What is window in the three apts is here a tiled wall behind the sink and worktop, capped with a long shelf. 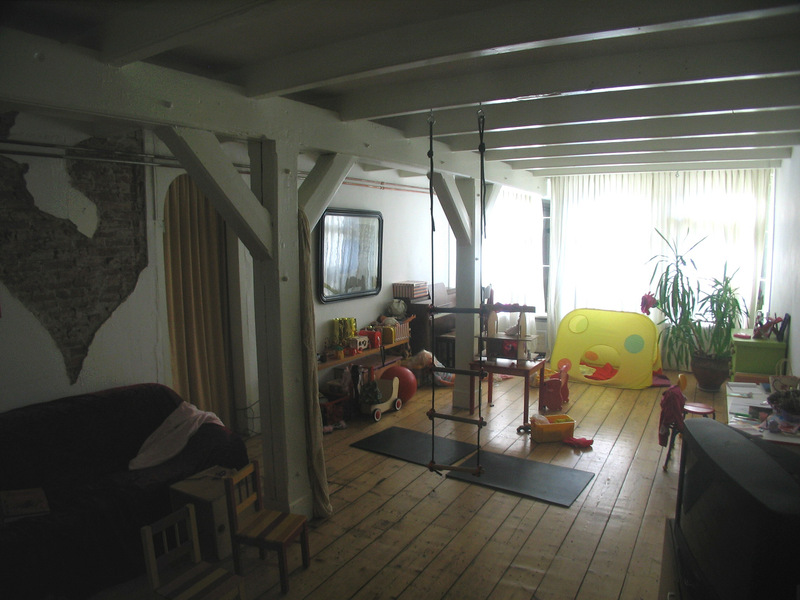 Marjolijn was the first inhabitant of the N-centre apt. This apt occupies the first of the bays whose windows are full height. 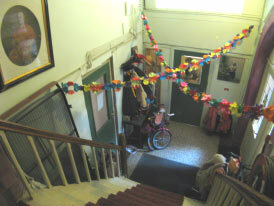 The apt's entry is open onto the common-space that connects all parts of the enclave. 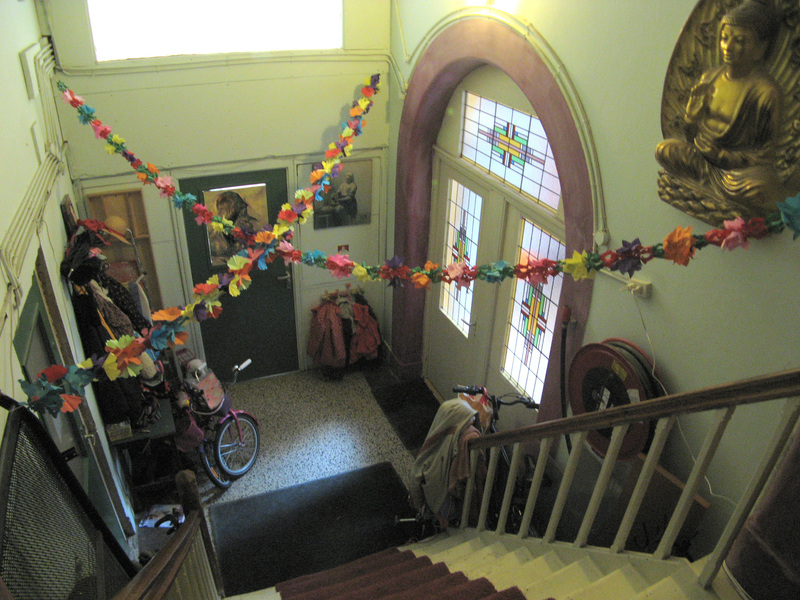 Seen from its entry door. Gemma was the first inhabitant of this S-end apt. 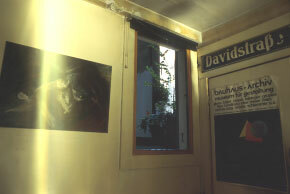 In 2004(? 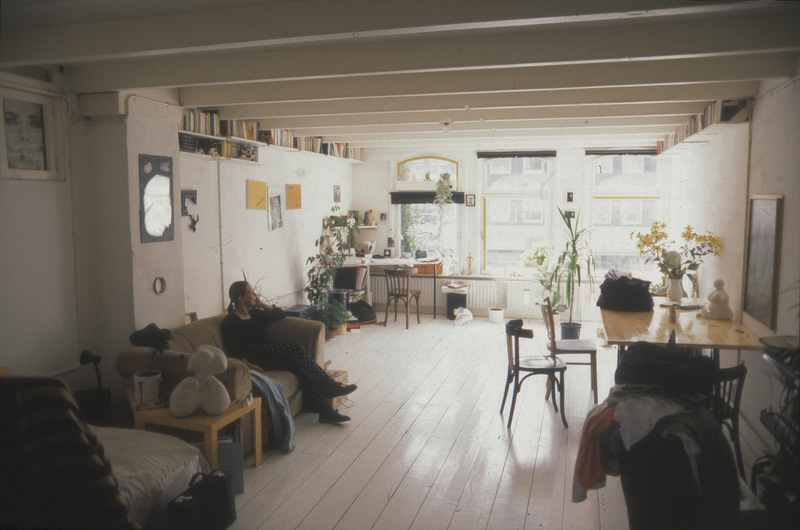 ), after Gisa left the north apt-space, two other Lettermagazijn inhabitants transformed this 1990s enclave into a single independent family home. 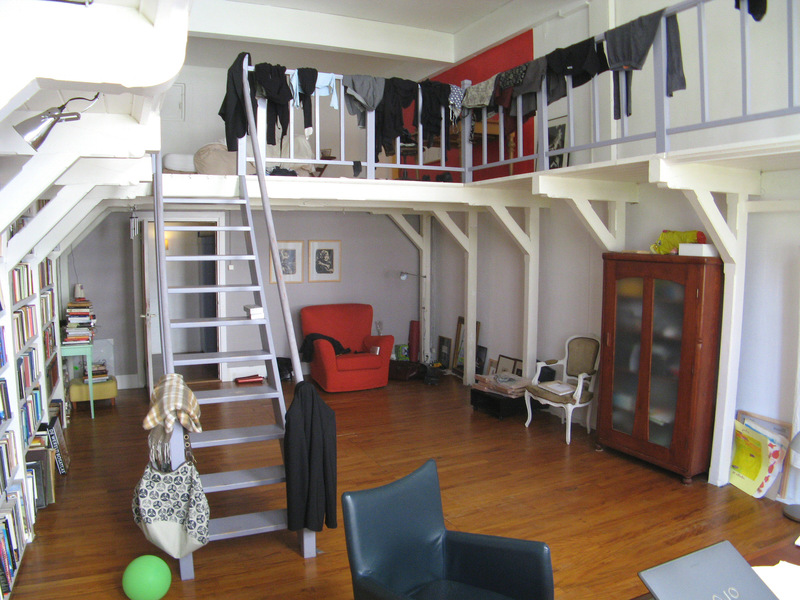 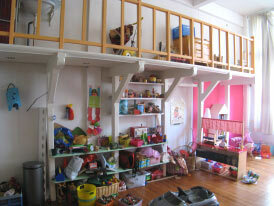 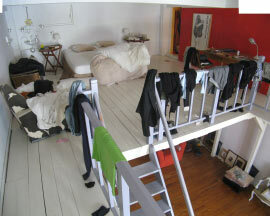 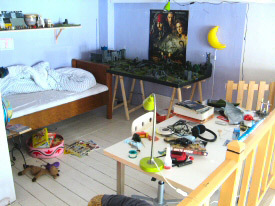 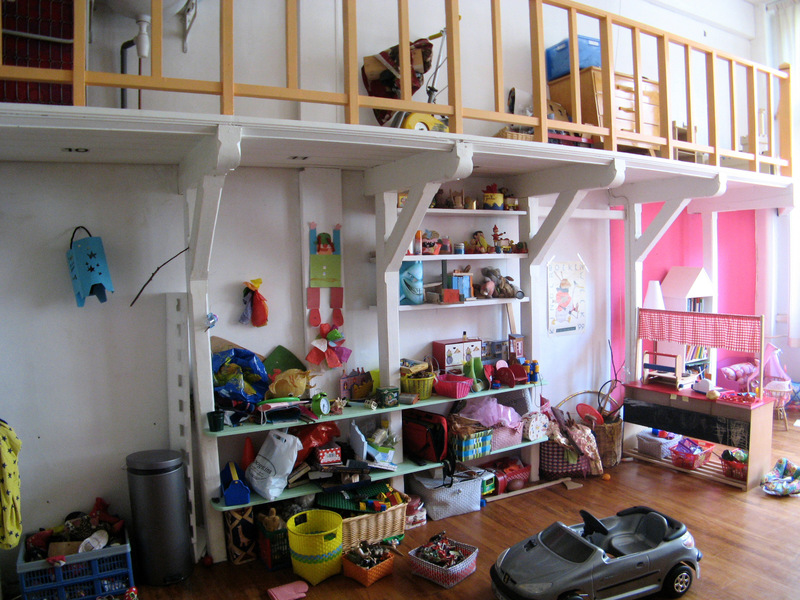 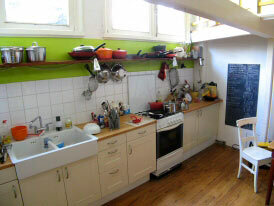 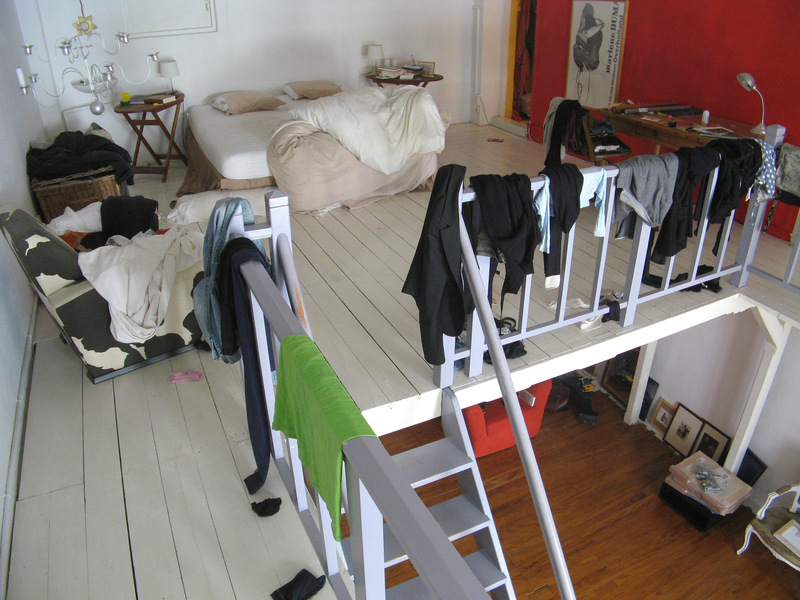 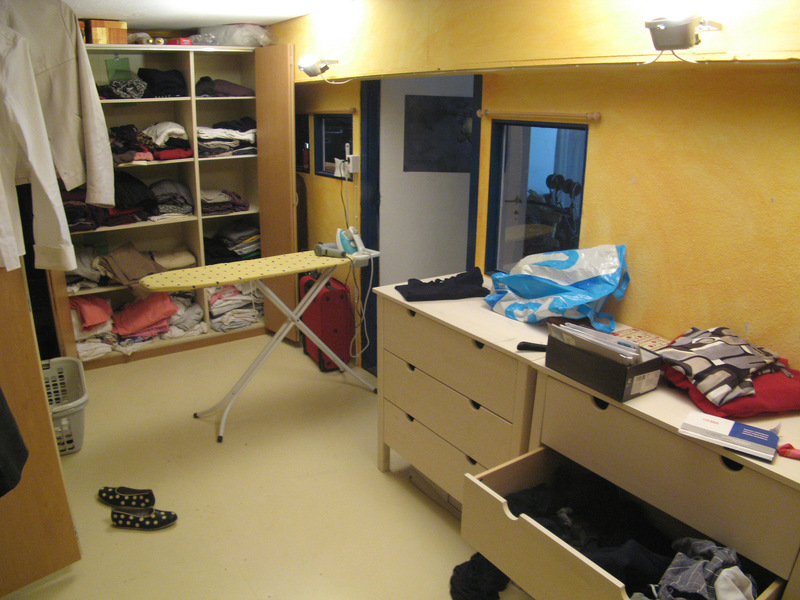 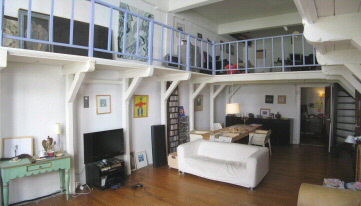 When recorded in 2008 this functional melding seems to have provoked only one structural-spatial change, an extending of their mezzanine sleeping space (in what was the north-apt) through a new opening in the dividing wall, onto a portion of the kitchen mezzanine; other changes are non-structural, consisting of redistribution of the family's accoutrements between the three previously separate apts. 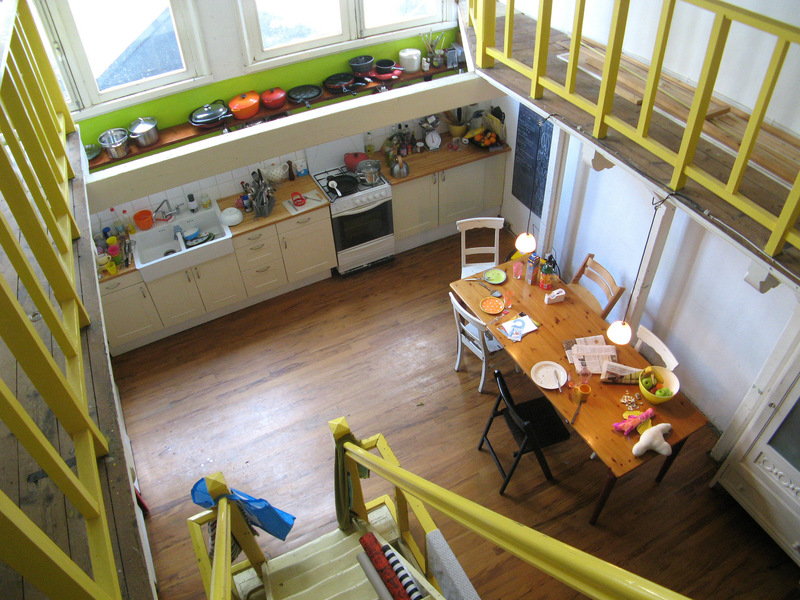 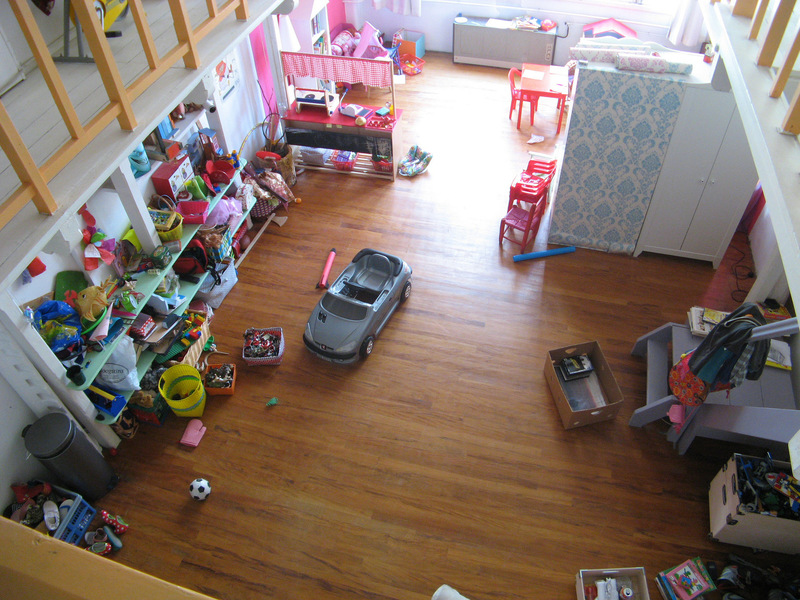 I will show the five main spaces continuously, but in a similar sequence to the above: 1: the N-end space kitchen is almost unchanged but its mezzanine has begun to be developed; 2: the N-centre space is one adult's work room, with the adults bedroom on its mezzanine; 3: the S-centre space is now the family living-room, with the other adult's work-space on its mezzanine; 4: the S-end space and its mezzanine is now the childrens space - the younger child uses its east portion, the older uses its mezzanine. 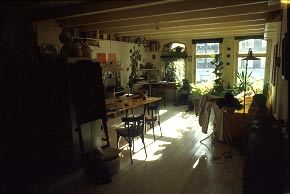 We enter this magnificent home from the Lettermagazijn's lobby at its S-end, into its 'connecting space' (a sort of wide straight passageway) that accesses in sequence its four main 'rooms' - the last (at the north end) is the kitchen - there the visit will begin. 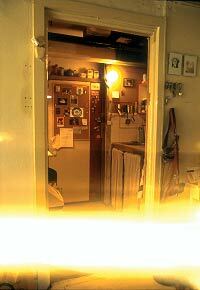 Past the (non-functional) 'lift' is the apt's S-entry from the (former) enclave's lobby. 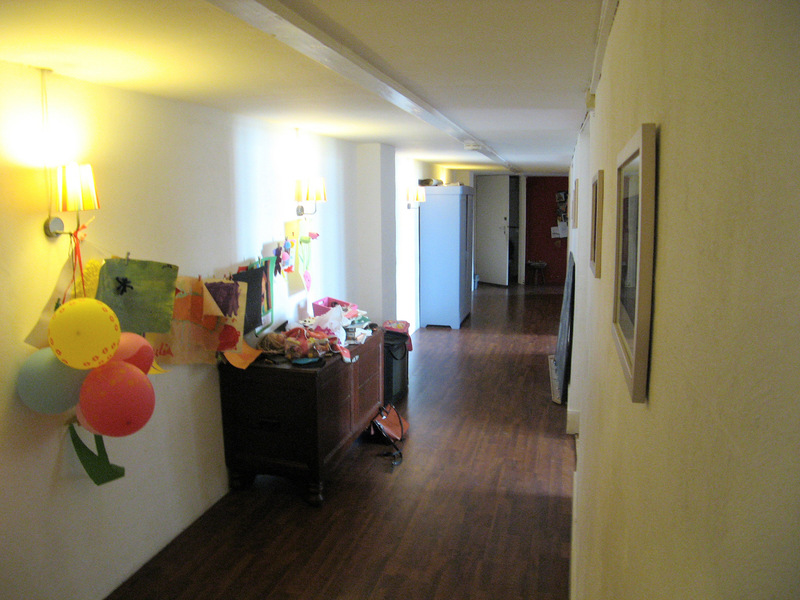 The apt's childrens' room opens to left. 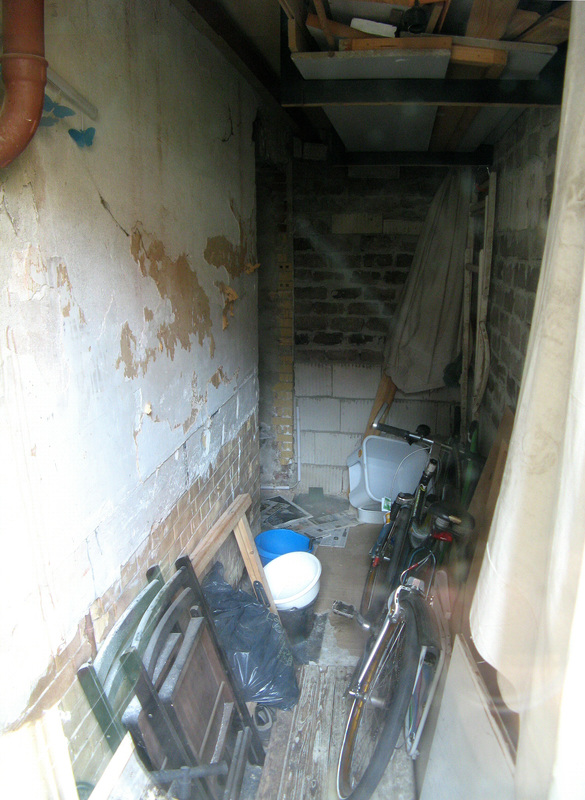 At the far end is a wc, the passage then turns right past a bath room and into the kitchen. At the far north end of the passage we turn right into the kitchen (substantially unchanged since the time of the enclave) and climb its yellow mezzanine stair. 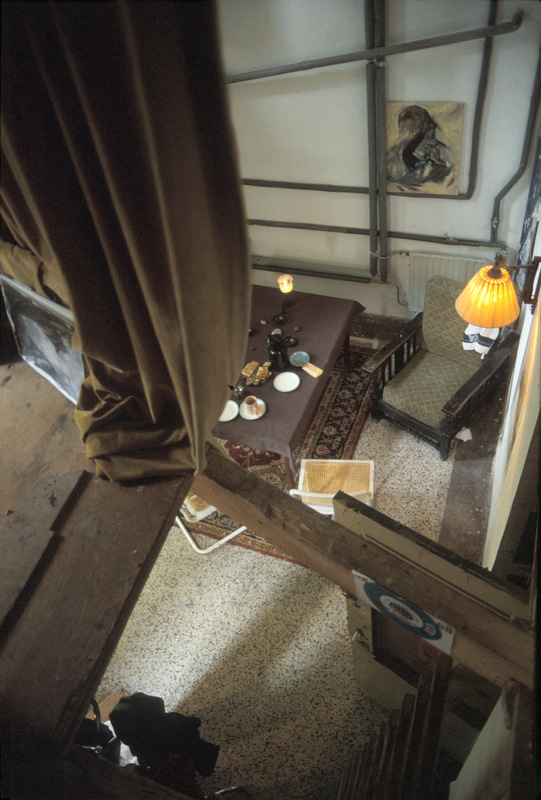 The 'kitchen-balcony' portion of this mezzanine is at present undeveloped except as a temp-store, however its rear portion, that reaches back over the bathroom and passage below, is a room dedicated to storage and service of fabrics and clothes, a functional adjunct of the adults' bedroom on the mezzanine of the neighbouring north-centre room and connected with it via an opening in the separating wall. 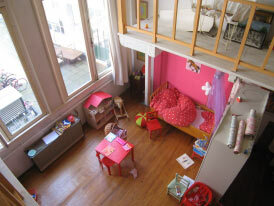 From the bedroom mezzanine of this north-centre space we descend into an adults' work room. 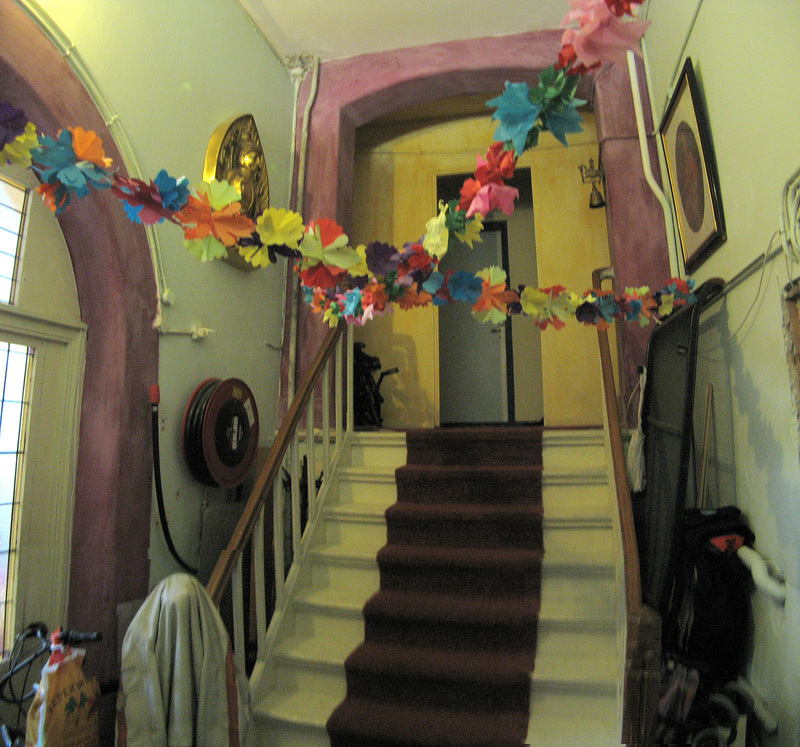 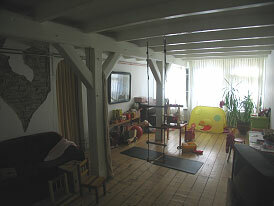 This space is the most northern of the erstwhile three enclave apts (it was once the apt of Gisa Küffner [see above]). 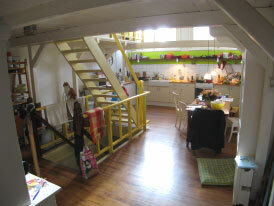 To pass from the north-center space to the next two we must use the connecting passage that runs under their mezzanines. 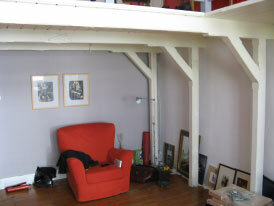 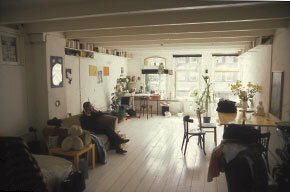 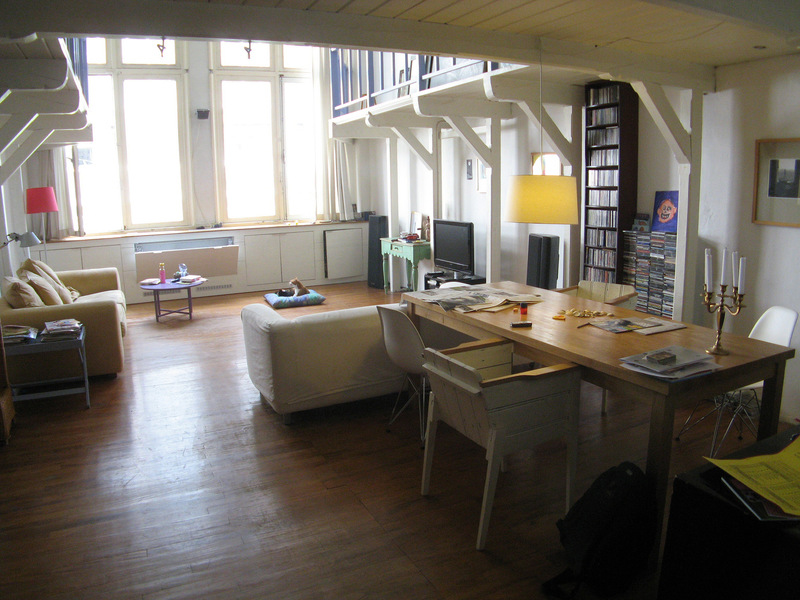 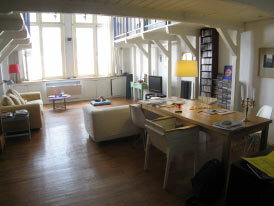 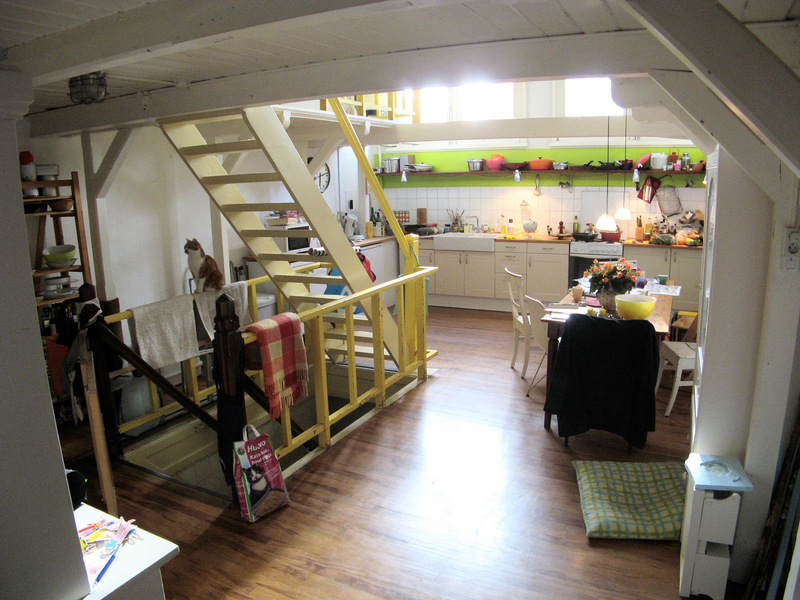 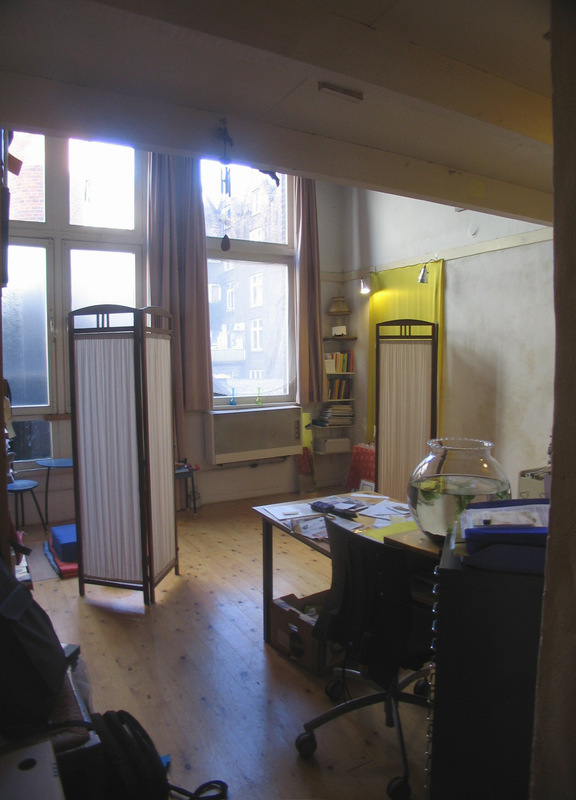 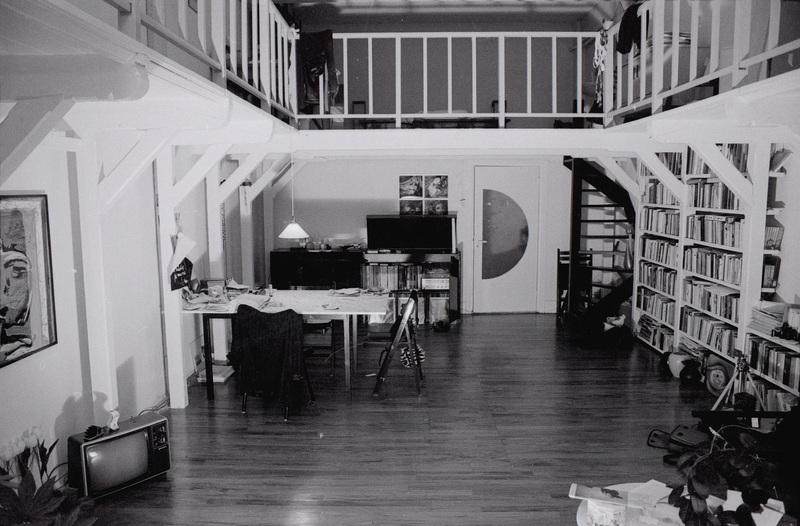 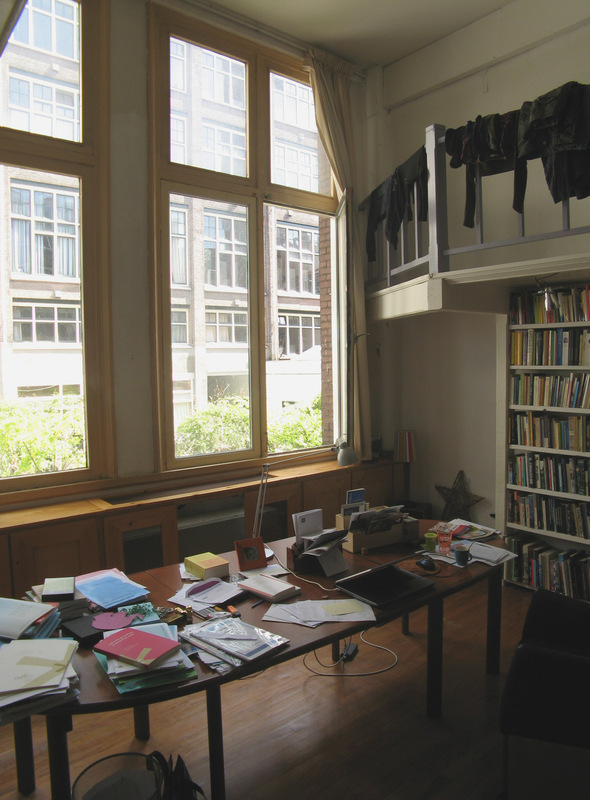 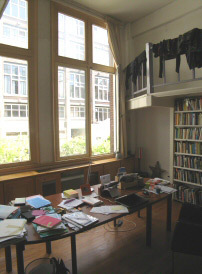 The next space (the 'south-center' one - once the apt of Geert-Jan [see above]) is the family sitting and dining room, with an adult's work space on its mezzanine. 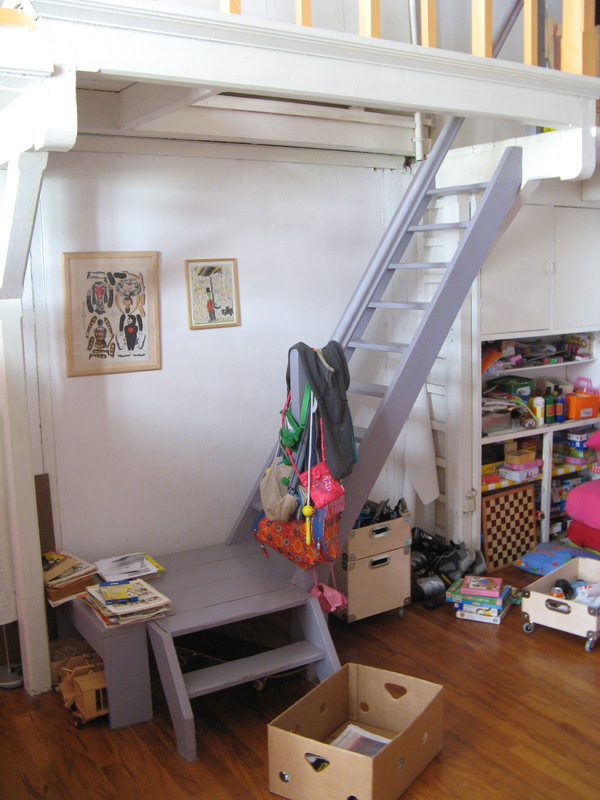 The last of the three huge 'cells', the south-end one nearest the apt's entry (once the apt of Willy [see above]), is divided between the two children - the eldest uses the mezzanine. 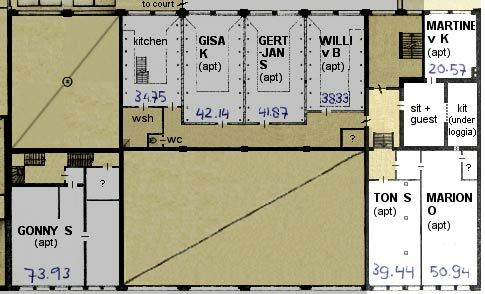 Thus all the major functions and needs of a family are clearly delineated and demarcated within this simple procession of four big volumes and their connecting space. The so-called "South Entresol" is accessed through a locked door on the first landing. 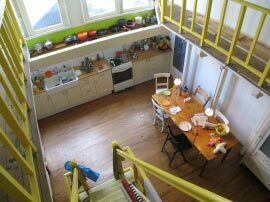 It comprises three apartments and a shared kitchen/eating-space with an added platform 'for guests'. 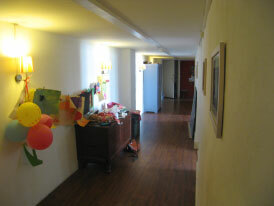 Confusingly, the "Entresol" is only part of the enclave. 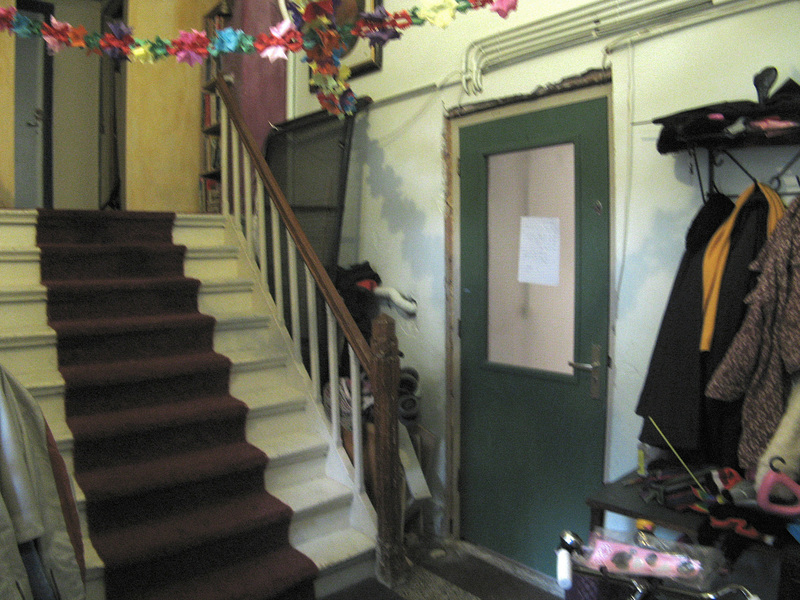 Up a short stair from the entry lobby are the two apts (Marion's and Ton's) that occupy the "Entresol" proper, the 'in-between floor' overlooking the Bilderdijkstraat, squeezed over shops in the building's SE corner. 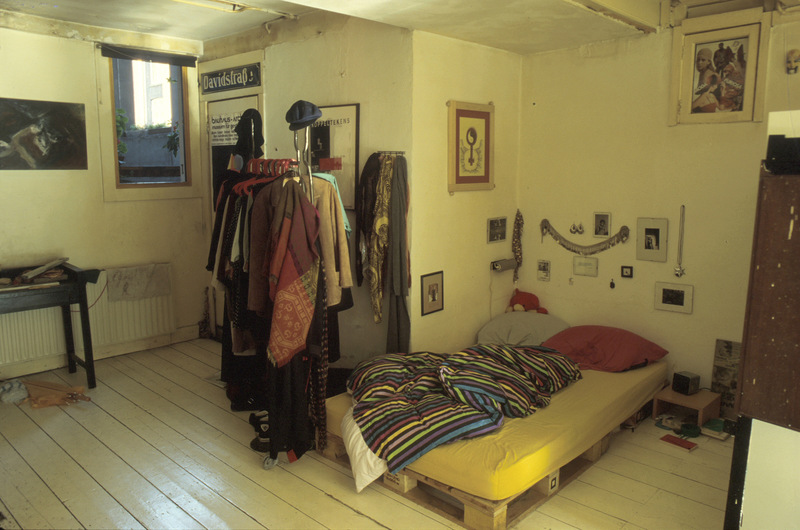 This has long been domestically occupied - before the squatters the Tetterode caretakers' families lived in rooms which overlapped these present living-spaces, which show a ghost plan of walls on the 90 year old floor. The central shared kitchen and the third apt (Martine's) flank the Lettermagazijn east of the entresol floor, in normal height Tetterode spaces. 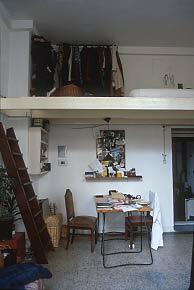 In 2006 I briefly visited the "S-Entresol" and discovered it had been transformed by new occupants into a single huge family home. 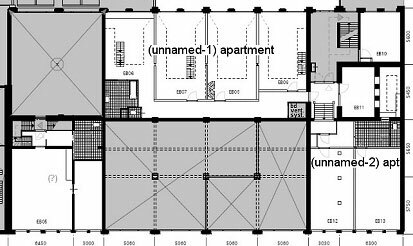 The "South Entresol" is a confusing label for an enclave which combines within its boundary the S-Entresol's two apts with conventional full-height spaces on the building's east side (an apt and the shared kitchen). 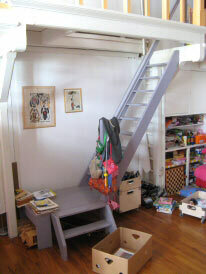 The stair up to the west-side 'entresol' portion of the enclave. 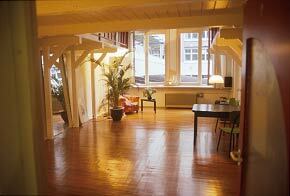 The sitting/dining room for the enclave. Through the arch is its kitchen. Overhead is a 'guest' platform. 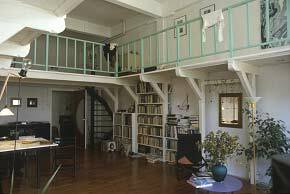 The three high windows (shared by the platform) open onto an open 'loggia' on Tetterode's S-facade (ref Marion's apt below). 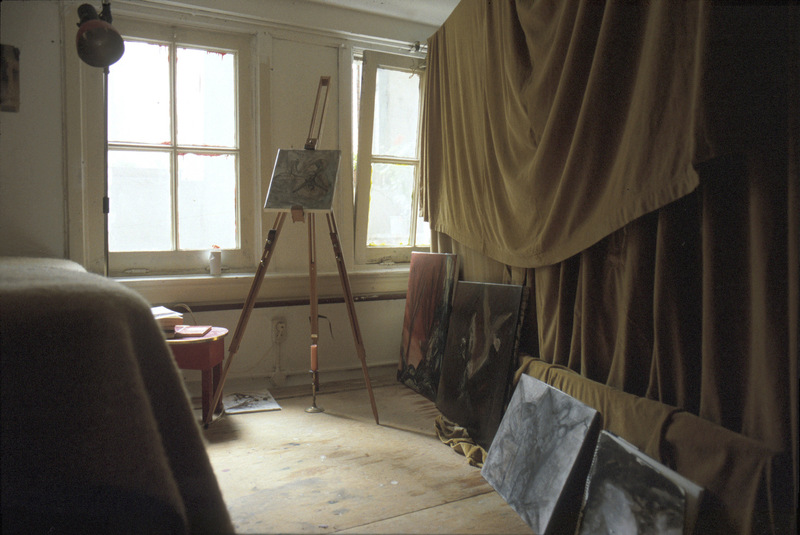 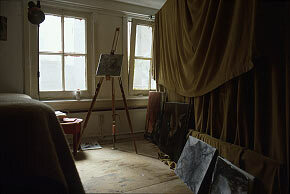 At this time Boris (a painter) occupied the 'guest' platform. 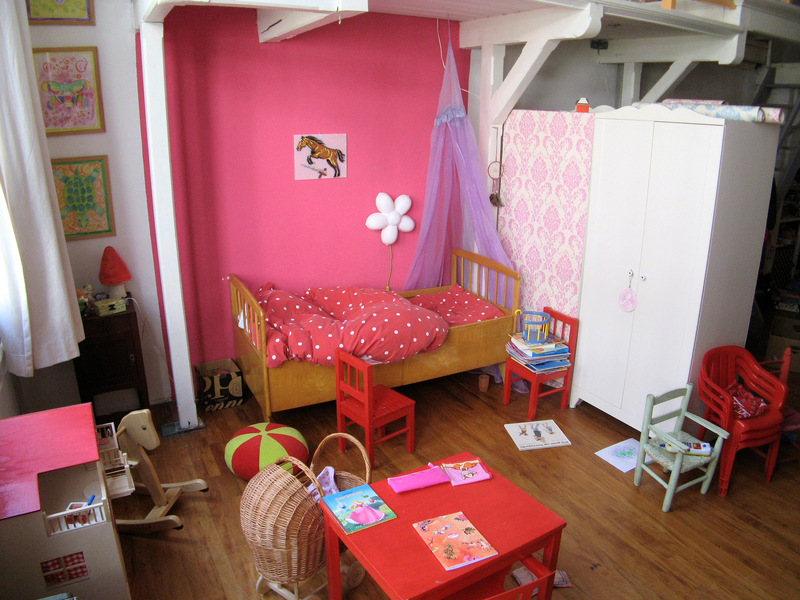 Martine's 1-bay space is a typical small 'Tetterode factory' platform apt, not in the 'real' entresol. Though included in the 'S-Entresol' enclave and opening off its shared central kitchen/diner, it is on the east side facing the courtyard; unlike the other two enclave apts on the Bilderdijk front, established in a unique type of Tetterode space, pre-designed for domesticity. In October 1987 Marion moved into a small dark room in the centre of the Entresol, opened its wall into this extensive space, walled a portion of the common landing for its kitchen/entry-hall and renovated its cupboard-sized shower and WC. 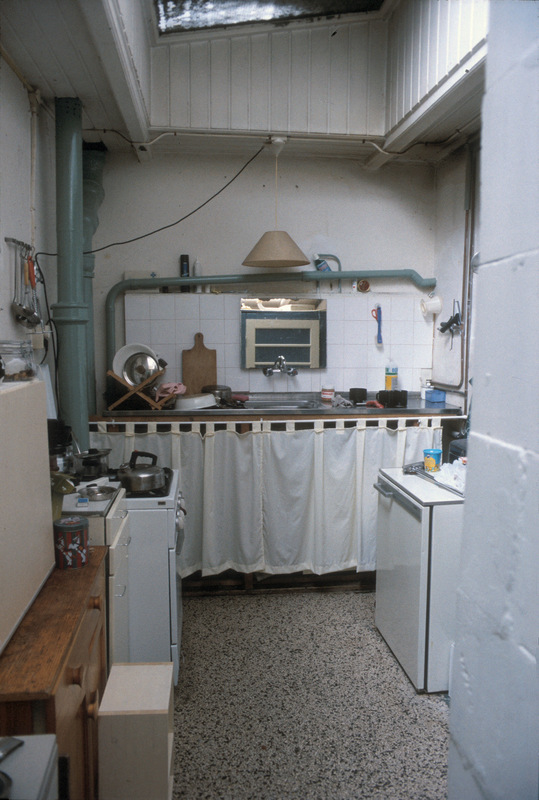 This long low clearly ordered room penetrating deeply into the building's width and opening above the street, typifies the style of many A'dam flats, but with 2 bizarre exceptions: its dark-red entry-hall is also a tiny cubic kitchen, and a picture-sized square opens in its rear wall onto a subject astonishingly detached from its setting: a dark vision of a huge-arched loggia with sky in its brows high over a chin-high floor. 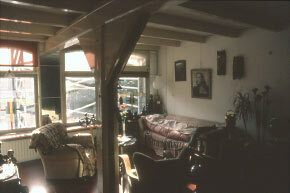 An unexplained feature of Tetterode's south facade. 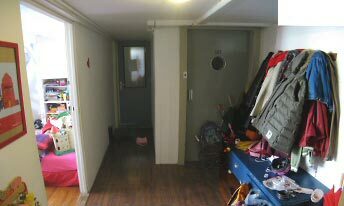 The apt's 'front-door' (serving also as a notice board) opens directly from the landing into a tiny kitchen/hallway - here viewed through its door into the main living-room.. 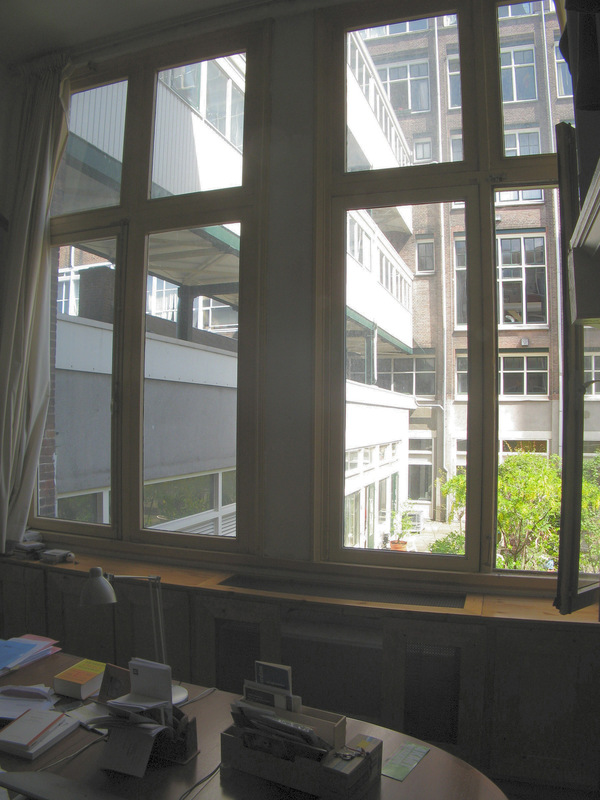 Looking out over Bilderdijkstraat at the S-end of Tetterode through the small windows of the "entresol", in a space originally designated for habitation rather than factory. 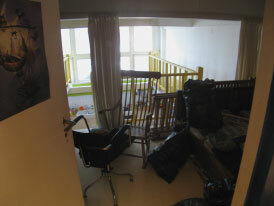 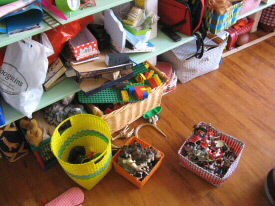 In three years since the last visit the living-space has been rearranged and houses more objects. 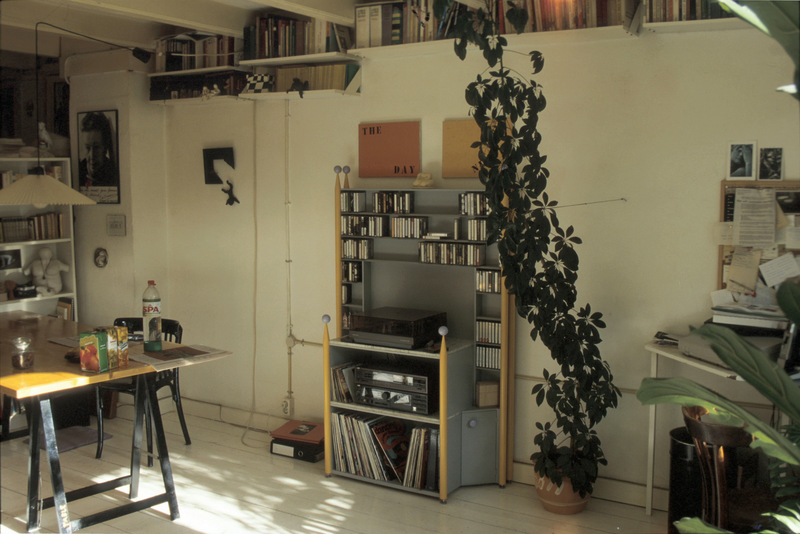 The yellow Music Cupboard (1993) was designed on paper and made by Rein in his workshop from new wood. The SE corner is a bed, a ## cubicle and a window exit to an exterior loggia. 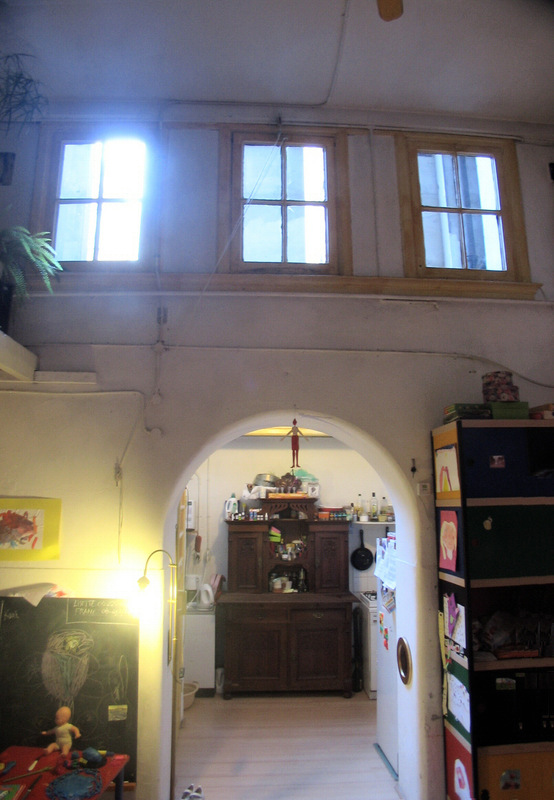 At the SE corner this small window gives access to an arched 'loggia'. 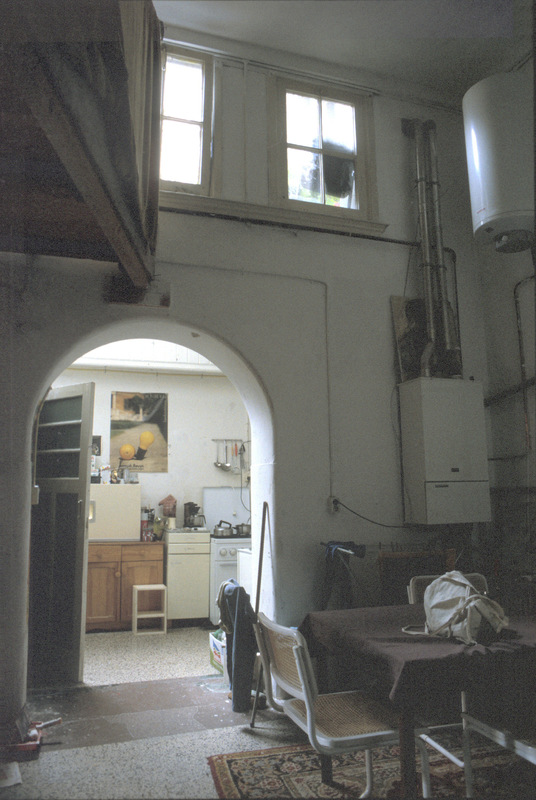 This strange 'left-over' space opens above the enclave's kitchen through Tetterode's SSE facade ...an arched loggia which Marion uses as a wash-drying area, accessing it through a small window at her apt's NE corner. 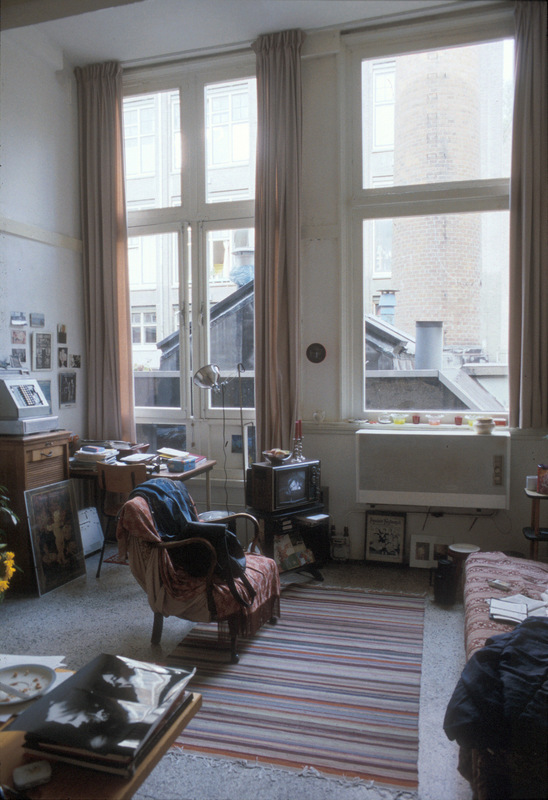 Adjoining Marion's apt is Ton's which looks out over Bilderdijkstraat at the S-end of Tetterode through the smaller windows of the "entresol", in an area originally designed for domestic use. 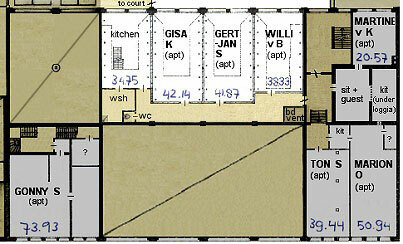 The smaller ½-building-width north "Entresol" is undivided - not an enclave but a single large isolated apt. 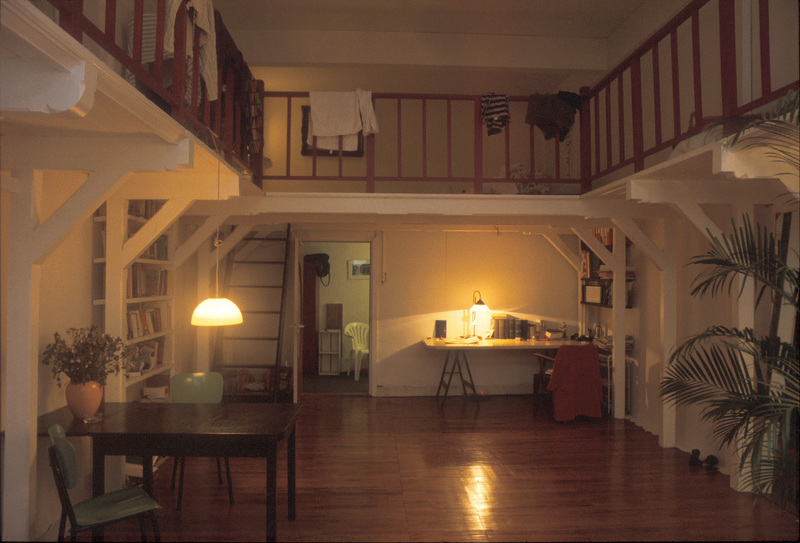 The "North Entresol" is an isolated large apt. 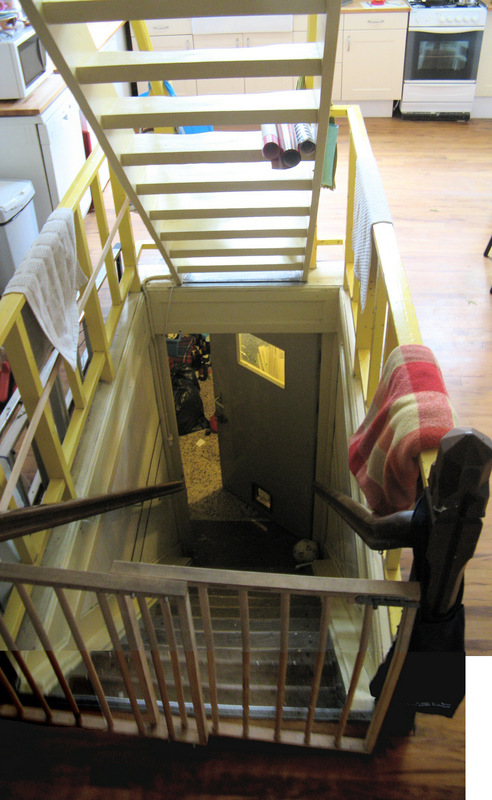 Opening directly from a circulation route, this is one of very few Tetterode apts not part of a locked enclave. Its 'front-door' is on the first landing of the Bilderdijk old building's N-stair.